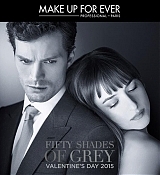 Make Up Forever will be launching a cosmetics line inspired by bestselling novels Fifty Shades of Grey, reported by Real Style Network. In the meantime, the beauty brand releases two new promotional stills of Jamie Dornan as Christian Grey and Dakota Johnson as Anastasia Steele in the movie. Check out the gallery below to view more images. The collection will include, Tease Me Lip Trios — a smudge-proof lip liner, a highly pigmented and long-wearing lip gloss and a lip gloss — and will be available in Innocent and Passionate, each $32. A blush trio titled Desire Me, will retail for $49 and is packaged inside a velvet pouch with a soft rope tie and a key. The final component of the collection is called Give In To Me, which is the largest set of the line. It will include an eyeshadow quad, eyeliner, lipstick and lip gloss. Those items will come in a keepsake box with a hidden compartment and will sell for $79. And with each set purchased you will find notes on how to apply the products from the head of the movie’s makeup department, Victoria Downs. The limited-edition “Fifty Shades” collection will be exclusive to Sephora and sephora.com on Dec. 26th. And the anticipated movie adaptation of the book starring Jamie Dornan as Christian Grey and Dakota Johnson as Anastasia Steele debuts Feb. 13, just in time for Valentine’s Day. I’m sure everybody would like to be Anastasia, definitely this will boost up Make Up Forever sales.